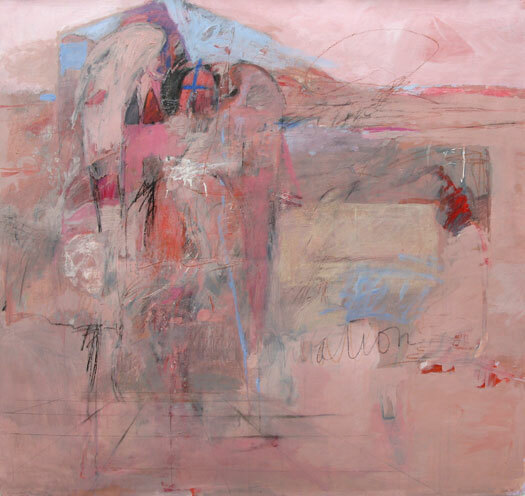 Sheba Sharrow, "Annunciation," 1990, 60in x 60in, Acrylic, mixed media on arches paper. Sheba Sharrow's "Annunciation" was not to quote a Christian event in particular or Christ but more likely a reference to the Renaissance painters to explore in a painting the "announcement" of the unnameable mystery that we all live within -- and what many call God. The biblical story of the Annunciation is beautful and there are similar revelations in all religions. 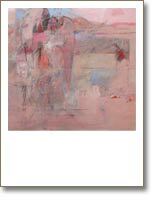 The artist consistently challenged herself to get closer to the truths of the human condition. 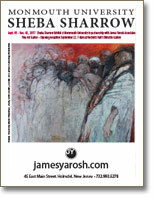 SAVE THE DATE: SEPT 05 - DEC 03, 2017 SHEBA SHARROW EXHIBIT AT MONMOUTH UNIVERSITY IN PARTNERSHIP WITH JAMES YAROSH ASSOCIATES. Sheba Sharrow- As seen in the 2013 VNA Charity Showhouse "Stately Homes by the Sea"
Four works featured in the "Living Room" space by interior designer Pat Mills of Byford & Mills. 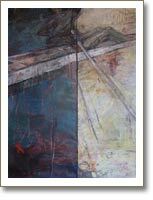 Artwork courtesy of James Yarosh Associates Fine Art Gallery. 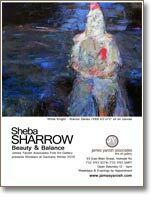 Sheba Sharrow (1926 - 2006): Born during the Great Depression and coming of age during World War II, Sharrow's personal art exemplifies an artist with eyes wide open. 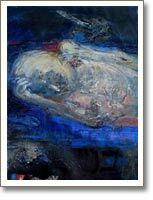 Her expressionist paintings abstract humanity using masterful execution, poetically engaging us with topics such as mortality, desire, vulnerability, power, warfare and spirituality. Weekdays and evenings by appointment. Kick off this festive season with our annual Holiday Show and Casual Weekend reception hours. 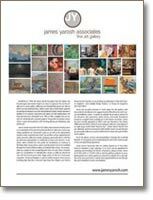 During this exclusive year's end event, we showcase the most recent works of our gallery's top talents, including the exciting debuts of artists new to the James Yarosh & Associates collection. Come—be inspired, be enlightened, see life from a different perspective. 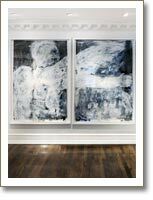 A collection of large white fine art paintings, including artists Vachagan Narazyan and Sheba Sharrow, are featured in the 2011 Stately Homes by the Sea charity show house. 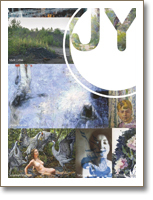 Artwork courtesy of James Yarosh Associates Fine Art Gallery is featured in the Room 30 presentation 'Effortless Chic' by interior designer Felicia Zwebner as part of the Rumson NJ show house benefiting the Visiting Nurse Association of Central Jersey. Previous show house collaborations include Kips Bay, New York and Cape May, Stately Homes by the Sea, and Twin Maples, New Jersey. 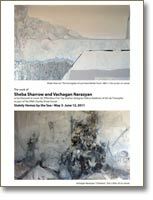 The art of Sheba Sharrow is featured in this solo exhibit at "Windows at Garmany", an on-going public art series of group and one man show exhibits. Garmany is a 40,000 square-foot luxury retail clothier on Broad Street in downtown Red Bank, New Jersey. Additional works are also on view at James Yarosh Associates Fine Art Gallery as part of our Holiday Show group show presentations.